I’m not an avid participant of #TBT (Throwback Thursday) on Instagram and Facebook. But every once in awhile, I feel compelled to post something a I see my newsfeed fill up with nostalgia. Israel has been on my mind the last couple of weeks, and as I drove home, I thought what better way to take part in #TBT than to post pictures of the best summer of my life. 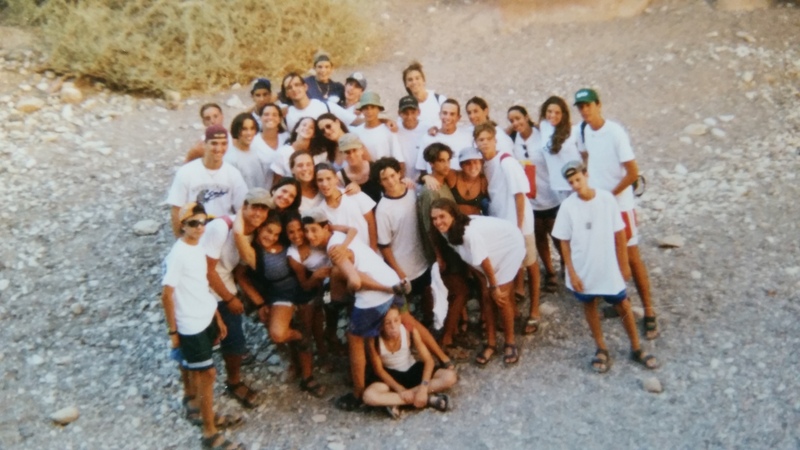 In 1995, I headed to Israel with a youth group consisting of about 40 friends. 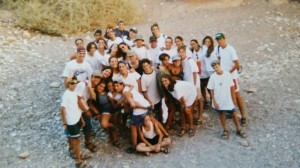 We had spent every Saturday and one night a week for the past school year training to become leaders/counselors, learning about Israel and bonding. This trip was the ultimate bonding experience. We spent 6 amazing weeks traveling the country, sleeping in the desert, repelling, clubbing and drinking, spending a night in a shelter, and simply making incredible memories. The most memorable week for me, although also the one I least enjoyed, was the week we spent in the “army.” I use the word army loosely because even though it felt rough to me, it’s only 1/8th of what the real army is probably like. We woke up at 5 am and had to make our bed, get dressed and be out of our tent in like 5 minutes. We prepped for breakfast and then cleaned all the pots and pans afterwards. We hiked or ran in the desert at night alternating carrying a stretcher and full jerry can on our backs. We learned to shoot M16s. There was nothing relaxing or fun about it to me. I think back to that week, or maybe it was only a few days, and try and picture what it is like for every Israeli at the age of 17 or 18 to enter a real training camp. 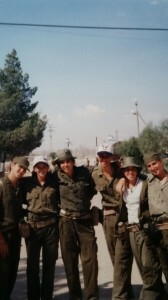 I think about them now as they get ready for a possible ground invasion of Gaza. And as I think about all of that, I know that that week I spent was a piece of cake. There was no danger whatsoever. Nothing was going to happen to me if I didn’t run fast enough or if I missed the target completely when shooting the M16. No one was shooting back at me and there was no threat of a rocket falling out of the sky. I am lucky to have been able to spend those 6 weeks in Israel and make the memories that will be with me for a lifetime. I can’t wait for the day that I can send my children to have that same experience. This is why I am thankful for Israel itself and for all those that defend it.